Holding steadfast to their New Year’s resolution to eat their way through Auckland’s degustation menus, Victoria Davy and “The Man” headed down to the acclaimed TriBeCa in Parnell. It was another freezing Auckland evening (sorry South Islanders, but it felt like Dunedin!) and due to my highly efficient cab driver who knew all the short cuts I arrived well before The Man and was warmly welcomed by Executive Chef Hayden McMillan, and then by owner Mark Walynetz. My coat was immediately taken and, as I sat and chatted with Chef McMillan, a glass of Bollinger was popped in my hand. 5 star service right there. TriBeCa’s ambiance is an absolute winner. Mark and his wife Pauline have managed to combine elegant dining in a sumptuous space with a homely feel. We felt so relaxed and comfortable – just like we were eating at a friend’s house. The 26 year old Hayden McMillan (formally of Meredith’s, French Cafe and Vinnie’s) has been Executive Chef for a mere 9 months. Being so new into his first Executive appointment his focus is on “flavours; matching flavours and using ingredients in the right way to extract the best from them”. He is a proud kiwi and all the ingredients used except one – cheese made by nuns in France (if you please) are from New Zealand. The menu begins with Oyster, Diamond Clams and Saffron Broth before it journeys through the likes of Fresh Smoked King Salmon, Masterstock Glazed Free Range Pork Belly, Warm Winter Salad with echouragnac (walnut infused cheese made by those nuns – yummo!) and Crispy Skin Duck Breast to name a few, and concludes with a chocolate crescendo, which The Man ate. I concluded my gobbling with a beautiful dessert that included blue cheese ice-cream. Oh my goodness, I love blue-cheese and this was de-ee-vine! All the zingyness of blue cheese with a sweet after taste. A perfect ending and I want a tub of that in my freezer. All of the dishes were unfailingly sublime and amongst this gastro gorgeousness it was hard to pick a favourite, but there were two standout courses for me. 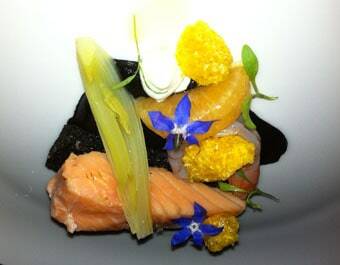 Firstly, the second course of Fresh Manuka Smoked King Salmon with squid ink infused brioche, charcoal smoked eggplant, freeze dried mandarins, prawn and lemon yoghurt. 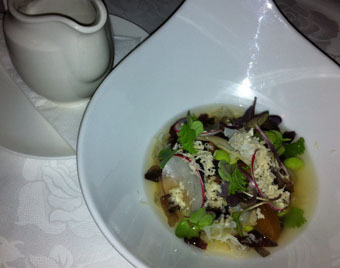 The presentation of this dish was truly ‘ooh’ and ‘ahh’ material. The brioche and eggplant were blacker than black and a perfect backdrop for the beautiful pink salmon, the orange mandarins and purple edible flowers. This was an artistic masterpiece on the plate and a masterpiece of perfectly rounded flavours on the palate, with the toasted brioche taking the combo of flavours to a new level. The pairing of Milton Voignier Gisbourne ‘09 worked wonderfully, refreshing the palate so it could experience the dish anew with each mouthful. My other favourite dish was the Braised Oxtail with honeycomb mushrooms, caramelised swede puree, karengo (NZ native seaweed), soya beans, radish, baby paua and miso consume served table side. Initially, this was like the essence of winter on a plate with the rich melt-in-your-mouth oxtail, deep miso flavoured consume and pure swede flavour. But then the taste of summer from the radish and freshness of the soya beans popped in the mouth, and the kick from the shaved horse radish lifted everything. It was like eating four seasons in one dish. The wine match of Seresin Gewurztraminer ’08 was excellent – I always find that summer and winter dishes pair well with this gutsy and yet subtle wine. This was a sublime evening from beginning to end. 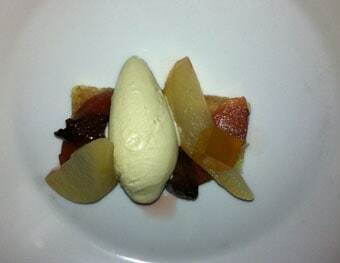 For a young Chef, Hayden’s food is mature, excellently balanced and accomplished. This, along with the genuinely warm hospitality, means we will definitely be returning to TriBeCa. Chef’s Tasting Menu $90.00 per person not including wine.